With Amazon S3 Glacier (Glacier) data retrieval policies, you can easily set data retrieval limits and manage the data retrieval activities across your AWS account in each region. For more information about Glacier data retrieval charges, see Glacier pricing. A data retrieval policy applies to standard retrievals only and manages retrieval requests made directly to Glacier. It does not manage data restore requests for the Amazon Simple Storage Service (Amazon S3) GLACIER storage class. For more information about the GLACIER storage class, see GLACIER Storage Class and Transitioning Objects in the Amazon Simple Storage Service Developer Guide. You can choose from three types of Glacier data retrieval policies: Free Tier Only, Max Retrieval Rate, and No Retrieval Limit. By using a Free Tier Only policy, you can keep your retrievals within your daily free tier allowance and not incur any data retrieval cost. If you want to retrieve more data than the free tier, you can use a Max Retrieval Rate policy to set a bytes-per-hour retrieval rate limit. The Max Retrieval Rate policy ensures that the peak retrieval rate from all retrieval jobs across your account in a region does not exceed the bytes-per-hour limit you set. If you don't want to set a retrieval limit, you can use a No Retrieval Limit policy where all valid data retrieval requests will be accepted. With both Free Tier Only and Max Retrieval Rate policies, data retrieval requests that would exceed the retrieval limits you specified will not be accepted. If you use a Free Tier Only policy, Glacier will synchronously reject retrieval requests that would exceed your free tier allowance. If you use a Max Retrieval Rate policy, Glacier will reject retrieval requests that would cause the peak retrieval rate of the in progress jobs to exceed the bytes-per-hour limit set by the policy. These policies help you simplify data retrieval cost management. Data retrieval policy settings do not change the 3 to 5 hour period that it takes to retrieve data from Glacier using standard retrievals. Setting a new data retrieval policy does not affect previously accepted retrieval jobs that are already in progress. If a retrieval job request is rejected because of a data retrieval policy, you will not be charged for the job or the request. You can set one data retrieval policy for each AWS region, which will govern all data retrieval activities in the region under your account. A data retrieval policy is region-specific because data retrieval costs vary across AWS regions. For more information, see Glacier pricing. You can set a data retrieval policy to Free Tier Only to ensure that your retrievals will always stay within your free tier allowance, so you don't incur data retrieval charges. If a retrieval request is rejected, you will receive an error message stating that the request has been denied by the current data retrieval policy. Setting your data retrieval policy to the Max Retrieval Rate policy can affect how much free tier you can use in a day. For example, suppose you set Max Retrieval Rate to 1 MB per hour. This is less than the free tier policy rate of 14 MB per hour. To ensure you make good use of the daily free tier allowance, you can first set your policy to Free Tier Only and then switch to the Max Retrieval Rate policy later if you need to. or more information on how your retrieval allowance is calculated, go to Glacier FAQs. You can view and update the data retrieval policies in the Glacier console or by using the Glacier API. To setup a data retrieval policy in the console, choose an AWS region and then click Settings. 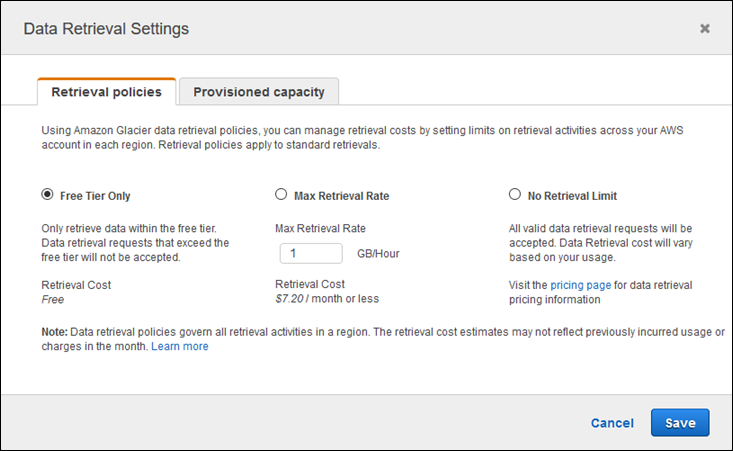 You can select one of the three data retrieval policies: Free Tier Only, Max Retrieval Rate, or No Retrieval Limit. If you click Max Retrieval Rate, you'll need to specify a value in the GB/Hour box. When you type a value in GB/Hour, the console will calculate an estimated cost for you. Click No Retrieval Limit if you don't want any restrictions placed on the rate of your data retrievals. You can configure a data retrieval policy for each region. Each policy will take effect within a few minutes after you click Save. You can view and set a data retrieval policy by using the Glacier REST API or by using the AWS SDKs. You can view and set a data retrieval policy by using the Glacier REST API. You can view an existing data retrieval policy by using the Get Data Retrieval Policy (GET policy) operation. You set a data retrieval policy using the Set Data Retrieval Policy (PUT policy) operation. When using the PUT policy operation you select the data retrieval policy type by setting the JSON Strategy field value to BytesPerHour, FreeTier, or None. BytesPerHour is equivalent to selecting Max Retrieval Rate in the console, FreeTier to selecting Free Tier Only, and None to selecting No Retrieval Policy. When you use the Initiate Job (POST jobs) operation to initiate a data retrieval job that will exceed the maximum retrieval rate set in your data retrieval policy, the Initiate Job operation will abort and throw an exception. AWS provides SDKs for you to develop applications for Glacier. These SDKs provide libraries that map to underlying REST API and provide objects that enable you to easily construct requests and process responses. For more information, see Using the AWS SDKs with Amazon S3 Glacier.